This is spicy, this is cheesy, this is creamy – and plain yum. Believe me. So try it today! 1. Cook the pasta according to directions. Meanwhile, prep your sauce. 2. In a frying pan, gently roast garlic and onion in a little olive oil. Add the chilis. 3. Add the tomato paste and vegetable broth or water and stir well. 4. Add spinach, nutritional yeast, vegan cheese and mustard. Add salt and pepper to taste. Let simmer for a bit. 5. 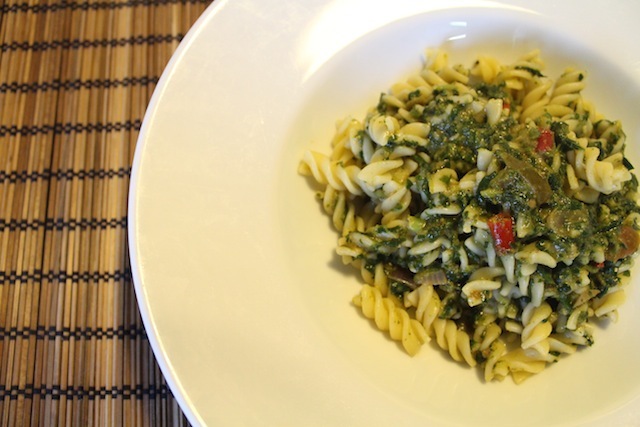 Mix with the pasta and enjoy!